The role of COX-2 has been extensively studied in colorectal cancers. It has been found that approximately 50% of adenomas and 80 - 85% of adenocarcinomas show increased expression of COX-2. Cancer of the cervix has been the most important cancer in women in India over the past two decades. Until now, only a few studies have been undertaken to evaluate the role of COX-2 in carcinomas of cervix. We tried to evaluate the role of COX-2 in carcinomas of cervix by studying the expression pattern in different types of carcinomas. This study was undertaken to show the differential expression pattern of COX-2 in carcinoma cervix. Both in-situ and invasive squamous cell carcinomas and invasive adenocarcinomas were included to note any difference in expression in these groups. An attempt was also made to correlate the expression pattern with tumor differentiation and lymphovascular invasion. Seventy cases of carcinoma cervix (20 in-situ, 42 invasive squamous cell carcinoma [SCC], and 8 adenocarcinomas [Stage II A, FIGO]) were studied over a period of two years. Twenty cervical biopsies and 50 hysterectomy specimens were included in the study. Formalin-fixed paraffin-embedded tissue sections were stained with Hematoxylin and Eosin. The histologic grade, depth of invasion, and presence of lymphovascular invasion were noted. Lymph node status was noted in hysterectomy specimens. 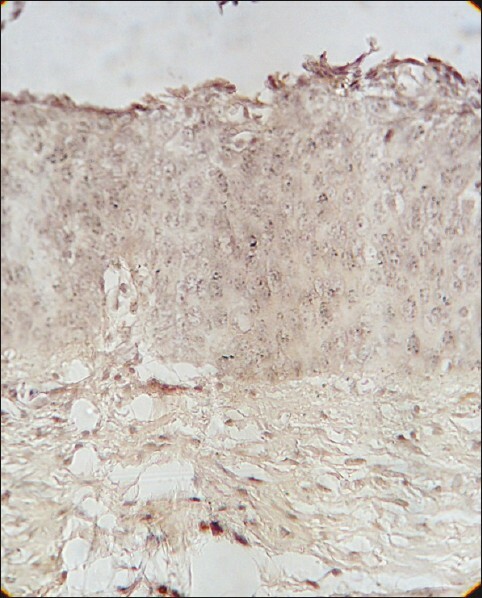 Immunohistochemistry for COX-2 was performed using rabbit monoclonal antibody to COX-2 and supersensitive polymer based detection system (Biogenex). Formalin fixed, paraffin embedded tissue sections were used for staining. After deparaffinization, tissue sections were rehydrated using descending grades of alcohol and water. Antigen retrieval was done by heat treatment using microwave oven. Tris buffer saline (TBS) was used for washing. Peroxide blocking was done for 10 minutes. This was followed by power block for 10 minutes, cleaning and incubation with primary antibody overnight at 4°C. Slides were washed again in TBS and incubated with secondary antibody for 30 minutes. After washing and cleaning, link label was added and incubated for 30 minutes. After washing in buffer, DAB was added and incubated for 10 minutes. After washing, slides were counterstained with Hematoxylin. Positive staining showed cytoplasmic and membrane positivity. Cases of colon carcinoma were taken as positive controls. Positive staining pattern was graded as: undetected, low (expressed in 10% tumor cells), moderate (10-50% positive tumor cells), and high (>50% positive tumor cells). Statistical analysis was performed with Fisher's two-tailed exact test (with Freeman Halton extension). For the statistical purpose, the expression pattern was classified as expressed (including low, moderate and high positivity) and not expressed (including the undetected cases). In the carcinoma in-situ (CIN) III SCC group, the age at presentation ranged from 25 to 47 years. Invasive SCC cases presented between 35-47 years of age. Out of 42 cases of invasive SCC, we noted nine keratinizing, 21 large cell non keratinizing (LCNK) and 12 small cell non keratinizing tumors. Studying the COX-2 expression pattern in in-situ SCC, a low rate (20% of cases) of positivity was noted [Figure 1] and [Figure 2]. However, in the invasive SCC group, percentage of positive cases was higher [Table 1] and [Figure 3]. Classifying the COX-2 expression in two groups as expressed and non-expressed, there was a significant difference between the CIN III and invasive SCC with expression being more in the invasive cases (P = 0.002) [Table 1]. In the invasive SCC, positive expression was noted in all the three types. No relation was noted between COX-2 expression pattern and histological differentiation of the tumor (P = 0.717) [Table 2]. Cases of invasive SCC were studied for lymphovascular invasion. Out of 26 cases showing lymphovascular invasion, positive COX-2 expression was seen in 20 (77%) cases [Table 3]. Analyzing the results, the frequency of COX-2 expression was found to be significantly more in lymphovascular invasion-positive tumors (P = 0.001; Relative Risk 3.08). We encountered 30 cases of metastatic involvement of different lymph nodes. Thus, the COX-2 expression did not vary between the cases showing metastasis and those without lymph node involvement. COX- 2 positivity was found in cases of adenocarcinoma of cervix [Figure 4]. All the positive cases showed moderate to high positivity and the intensity of staining was also higher than SCC. However, comparing this group with the SCC group, there was no statistically significant difference in COX-2 expression between them (P = 0.112) [Table 4]. Studies on the expression of COX-2 in cervical cancer are relatively few. It has been shown to be expressed in dysplastic epithelium and in invasive carcinomas. 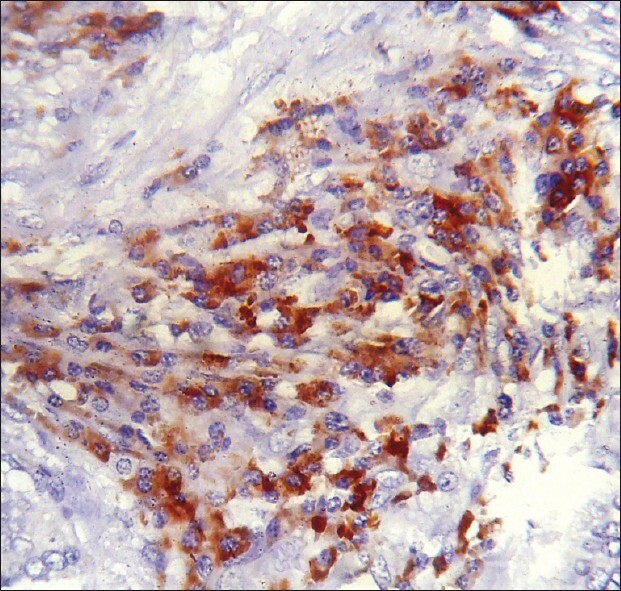 The number and intensity of positive COX-2 staining has been shown to increase with the severity of dysplasia. But the expression of COX-2 is lower in in-situ carcinomas compared to invasive carcinomas. Dai et al. reported that COX-2 expression was positive in 45% of cases of CIN. Similar results have been showed by Farley et al. Dersun et al. have shown 25% positivity in CIN-3 and 55% in invasive SCC. This group has suggested that COX-2 may participate in the progression of cervical SCC. Similarly, in the present study, we encountered a lower rate of positivity in CIN; only 20% of CIN shows positivity for COX-2 compared to 66.6% of invasive SCC. The difference in expression between these two groups was found to be statistically significant. COX-2 expression has been shown to be an independent poor prognostic factor in patients receiving radiation therapy. There was a significant difference in five-year disease-free survival in tumors expressing COX-2. Other studies have demonstrated association of elevated COX-2 expression with parametrial invasion and lymph node metastasis. These studies point toward a role of COX-2 as a prognostic marker. 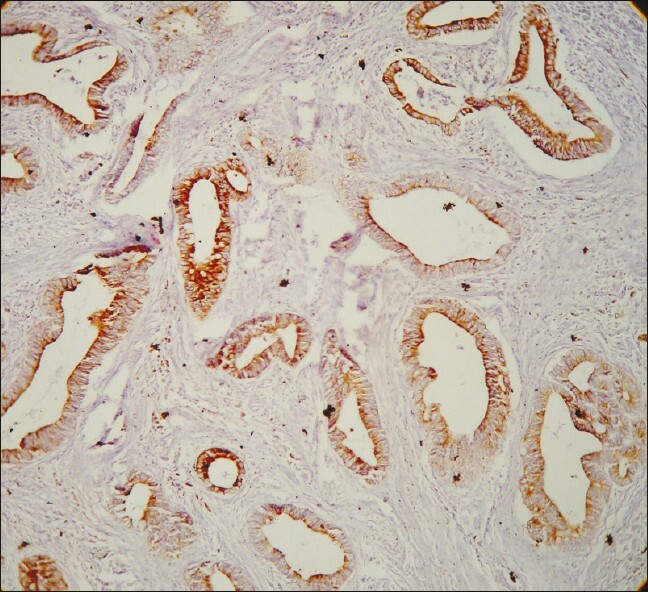 Lymphovascular invasion has been found to be associated with positive COX-2 expression in other tumors like carcinoma of the breast. Presence of lymphovascular invasion is an established parameter of prognosis in cervical carcinomas. It has been reported that the presence of lymphovascular invasion increases the risk of lymph node metastasis and tumor-related death and reduces the overall and disease-free survival. A positive association of COX-2 expression and the presence of lymphovascular emboli was found in the present study. This observation again points to the probable role of COX-2 expression as a prognostic marker and it may be used in conjunction with other major criteria in modifying the postoperative adjuvant therapy in SCC. ,, However, some investigators have found no significant correlation between the COX-2 expression and tumor response in patients who have undergone radiotherapy. Only a few studies have evaluated association between COX-2 expression and lymph node metastasis. One of them found an association of COX-2 expression and lymph node metastasis,  where as another reported an association between COX-2 expression and lymphovascular invasion and larger tumor size, but not with parametrial involvement, lymph node metastasis recurrences, and survival. One large series with 196 cases has reported an association of COX- 2 expression with lymph node metastasis. In our series, COX-2 expression was seen in a higher number of cases with metastatic disease. However, the difference was not found to be statistically significant. In conclusion, our study shows that COX-2 expression is more in cases of invasive SCC than its in-situ counterpart. Positive COX-2 expression has a strong association with presence of lymphovascular invasion. Cervical adenocarcinomas show strong positivity with intense staining pattern. Studies with larger number of cases are required to evaluate the role of COX-2 in cervical adenocarcinomas and the potential therapeutic role of COX-2 inhibitors in such cases. Dr. Avijit Hazra, Associate Professor, Department of Pharmacology, Medical College, Kolkata for the statistical help provided. 1. Harris RC, McKanna JA, Akai Y, Jacobson HR, Dubois RN, Breyer MD. Cyclooxygenase-2 is associated with the macula densa of rat kidney and increases with salt restriction. J Clin Invest 1994;94:2504-10. 2. Williams CS, Mann M, DuBois RN. The role of cyclooxygenases in inflammation, cancer, and development. Oncogene 1999;18:7908-16. 3. Eberhart CE, Coffey RJ, Radhika A, Giardiello FM, Ferrenbach S, Dubois RN. Up-regulation of cyclooxygenase 2 gene expression in human colorectal adenomas and adenocarcinomas. Gastroenterology 1994;107:1183-8. 4. Nandakumar A, Ramnath T, Chaturvedi M. The magnitude of cancer cervix in India. Indian J Med Res 2009;130:219-21. 5. Hull MA. Cyclooxygenase-2: How good it is as a target for cancer chemoprevention. Eur J Cancer 2005;41:1845-63. 6. Smith WL, Langenbach R. Why there are two cyclooxygenase isozymes. J Clin Invest 2001;107:1491-5. 7. Dannenberg AJ, Altorki NK, Boyle JO, Dang C, Howe LR, Weksler BB, et al. Cyclooxygenase-2: A pharmacological target for the prevention of cancer. Lancet Oncol 2001:2;544-51. 8. Shamma A, Yamamoto H, Doki Y, Okami J, Kondo M, Fujiwara Y, et al. Up-regulation of cyclooxygenase-2 in squamous carcinogenesis of the esophagus. Clin Cancer Res. 2000;6:1229-38. 9. Lim HY, Joo HJ, Choi JH, Yi JW, Yang MS, Cho DY, et al. Increased expression of cyclooxygenase-2 protein in human gastric carcinoma. Clin Cancer Res 2000;6:519-25. 10. Shim V, Gauthier ML, Sudilovsky D, Mantei K, Chew KL, Moore DH, et al. Cyclooxygenase-2 expression is related to nuclear grade in ductal carcinoma in situ and is increased in its normal adjacent epithelium. Cancer Res 2003;63:2347-50. 11. Shirahama T. Cyclooxygenase-2 expression is up-regulated in transitional cell carcinoma and its preneoplastic lesions in the human urinary bladder. Clin Cancer Res 2000;6:2424-30. 12. Maitra A, Ashfaq R, Gunn CR, Rahman A, Yeo CJ, Sohn TA, et al. Cyclooxygenase 2 expression in pancreatic adenocarcinoma and pancreatic intraepithelial neoplasia: An immunohistochemical analysis with automated cellular imaging. Am J Clin Pathol 2002;118:194-201. 13. Farley J, Uyehara C, Hashiro G, Belnap C, Birrer M, Salminen E. Cyclooxygenase-2 expression predicts recurrence of cervical dysplasia following loop electrosurgical excision procedure. Gynecol Oncol 2004;92:596-602. 14. Kim JY, Lim SJ, Park K, Lee CM, Kim J. Cyclooxygenase-2 and c-erbB-2 expression in uterine cervical neoplasm assessed using tissue microarray. Gynecol Oncol 2005;97:337-41. 15. Dai Y, Zhang X, Peng Y, Wang Z. The expression of cyclooxygenase-2, VEGF and PGs in CIN and cervical carcinoma. Gynecol Oncol 2005;97:96-103. 16. Chen YJ, Wang LS, Wang PH, Lai CR, Yen MS, Ng HT, et al. 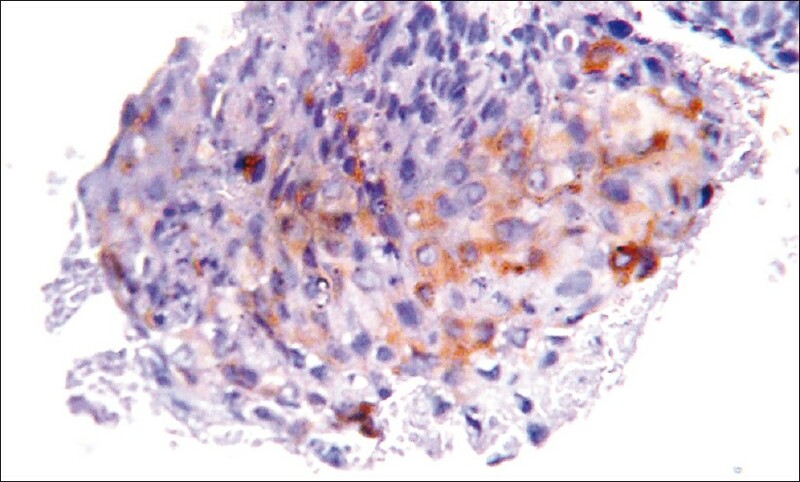 High cyclooxygenase expression in cervical adenocarcinomas. Gynecol Oncol 2003;88:379-85. 17. Ferrandina G, Lauriola L, Distefano MG, Zannoni GF, Gessi M, Legge F, et al. Increased cyclooxygenase expression is associated with chemotherapy resistance and poor survival in cervical cancer patients. J Clin Oncol 2002;20:973-81. 18. Lee JS, Choi YD, Lee JH, Nam JH, Choi C, Lee MC, et al. Expression of cyclooxygenase-2 in adenocarcinoma of the uterine cervix and its relation with angiogenesis and tumor growth. Gynecol Oncol 2004;95:523-9. 19. Dursun P, Yuce K, Usubutun A, Ayhan A. Cyclooxygenase-2 expression in cervical intraepithelial neoplasia III and squamous cell cervical carcinoma, and its relation with clinicopathologic variables. Int J Gynecol Cancer 2007;17:164-73. 20. Kim YB, Kim GE, Cho NH, Pyo HR, Shim SJ, Chang SK, et al. Overexpression of cyclooxygenase-2 is associated with a poor prognosis in patients with squamous cell carcinoma of the uterine cervix treated with radiation and concurrent chemotherapy. Cancer 2002;95:531-9. 21. Ryu HS, Chang KH, Yang HW, Kim MS, Kwon HC, Oh KS. High cyclooxygenase-2 expression in Stage IB cervical cancer with lymph node metastasis or parametrial invasion. Gynecol Oncol 2000;76:320-5. 22. Wülfing P, Diallo R, Müller C, Wülfing C, Poremba C, Heinecke A, et al. Analysis of cycloxygenase-2 expression in human breast cancer: High throughput tissue microarray analysis. J Cancer Res Clin Oncol 2003;129:375-82. 23. Delgado G, Bundy B, Zaino R, Sevin BU, Creasman WT, Major F. Prospective surgical-pathological study of disease-free interval in patients with stage IB squamous cell carcinoma of the cervix: A Gynecologic Oncology Group study. Gynecol Oncol 1990;38:352-7. 24. Crissman JD, Makuch R, Budhraja M. Histopathologic grading of SCC of the uterine cervix. An evaluation of 70 stage Ib patients. Cancer 1985;55:1590-6. 25. Barber BR, Sommers SC, Rotterdam H, Kwon T. Vascular invasion as a prognostic factor in stage lB cancer of the cervix. Obstet Gynecol 1978;52:343-8. 26. Kang MK, Park W, Choi Y-L, Cho EY, Ahn G, Nam H, et al. The effect of cyclooxygenase-2 expression on tumor volume response in patients treated with radiotherapy for uterine cervical cancer. J Korean Med Sci 2009;24:1170-6. 27. Kim MH, Seo SS, Song YS, Kang DH, Park IA, Kang SB, et al. Expression of cyclooxygenase-1 and -2 associated with expression of VEGF in primary cervical cancer and at metastatic lymph nodes. Gynecol Oncol 2003;90:83-90. 28. Khunamornpong S, Settakorn J, Sukpan K, Srisomboon J, Ruangvejvorachai P, Paul S, et al. Cyclooxygenase-2 expression in squamous cell carcinoma of the uterine cervix is associated with lymph node metastasis. Gynecol Oncol 2009;112:241-7. 29. Jung YW, Kim SW, Kim S, Kim JH, Cho NH, Kim JW, et al. Prevalence and clinical relevance of cyclooxygenase-1 and -2 expression in stage IIB cervical adenocarcinoma. Eur J Obstet Gynaecol Reprod Biol 2010;148:62-6.